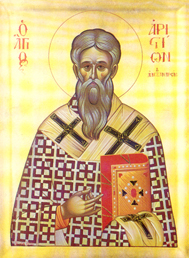 The holy, glorious, right-victorious hieromartyr Aristion of Alexandria (Cilicia) was the bishop of lesser Alexandria (Isso) in Cilicia (Asia Minor) during the second century. During the persecutions of the time, he was arrested, tried, and martyred for being a Christian. He is remembered on September 3. Aristion was born in the small town of Aribazo in the eparchy of Apamea, Syria at the beginning of the second century. His parents were pagans, and he spent his early years in an atmosphere of idolatry. Little is known of his early life such as what sort of education he received, nor where he studied. The future martyr, Anthony, as a ten-year-old boy, lived in the same town and led Aristion on the path to the truth, instructing him in the true Faith. Thus, Aristion increased in piety and zeal for God. Despite the constant fear of persecution, exile, and even danger to his own life, Anthony was not just a member of the local church, but also preached the Faith to others. It is certain that Aristion prayed for his young friend and remembered his courage and strength, for Anthony's efforts to bring Aristion to the saving Faith had born fruit and were not in vain. Not only did Anthony give himself to the Church through his martyrdom at the age of twenty, he also gave it another saint and martyr: St Aristion. Years later, Aristion was consecrated bishop of Isso in Cilicia, which is found in lesser Alexandria. He was a good shepherd to his flock and cared diligently for their souls. One day the ruler of Alexandria had Aristion arrested because he was a Christian. Although he was placed on public trial, Aristion was calm and showed no fear. His whole demeanor made the Roman eparch realize that it would not be easy to deal with this man who stood before him. He tried to turn Aristion from Christ through flattery and promises of reward, but the saint stood firm. Seeing that his words had no effect on the bishop, he threatened him with fierce tortures. He was not influenced by these threats, however. Aristion stood before the eparch and his counselors, gazing at them with love and concern for their salvation. Even in his weakness, this captive was stronger than his captors, and he refused to offer sacrifice to the pagan gods. Before a multitude of idolaters, Aristion spoke of the Triune God, by Whom all things were created. He also told them about the Incarnation of the Lord Jesus Christ, which was accomplished through God's saving dispensation. He explained that Christ brings salvation to fallen man, thereby giving him another chance to attain the true purpose of his life - theosis. "How poor these soulless statues of the gods are," the bishop said, "and how helpless the eparch looks in his radiant apparel." All who heard the saint speak were amazed and asked one another where he got such courage. Aristion invited them to believe in the truth which he was revealing to them. Those who watched understood that this holy man was someone special, and they wanted to hear more about his beliefs. The Roman eparch could not find any way to resist Aristion except through violence, so he sentenced him to death. He commanded his soldiers to prepare a large furnace and then throw him into the flames. The saint went to his martyrdom without resistance, remaining brave and strong until the end. The few Christians who were present tried not to weep. They whispered prayers for him and were saddened because their father was leaving them. They knew, however, that their archpastor would not cease praying for them, especially now that he was going to Christ. They could hear Aristion singing hymns in the fire until his last breath. The eparch did not know what a terrible mistake he had made. He did not realize that death is not the end for men, nor for the truth. Nothing could separate St Aristion from the Fountain of Life, and so the Lord bestowed upon him an imperishable crown of glory. After the flames died down, his spiritual children approached the furnace and collected as many of his bones as they could. With great reverence they put the holy relics in a secret place, which remains unknown to the present day. This page was last edited on September 3, 2014, at 10:58. This page has been accessed 24,715 times.